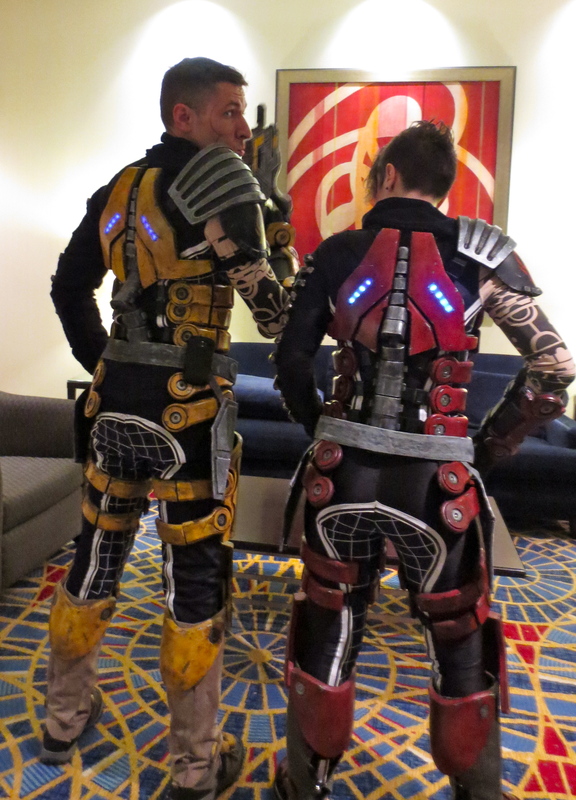 Thursday has become the unofficial “first” day at Dragon*Con, with Thursday night having just as many parties, costumes, and shenanigans as the other nights of Con (except for maybe Saturday?). I try to get down early-ish on Thursday whenever I can, and this year I had to drive down to Hotlanta by myself. Jon has just started the dental hygiene program at UNC, and it is the type of program where you can’t miss class unless you have Ebola or a death in the family, so there was no way Jon could miss his lecture on Friday. I wasn’t going to let his scholastic responsibilities interrupt my fun, however, so I piled all our stuff into my Civic on Thursday morning and made the 6.5 hour drive from Chapel Hill to Atlanta myself. I am happy to report that it was a totally smooth drive: no weather, no traffic (until I hit Atlanta, of course), and I got to the Sheraton by 5:00. I found a miracle spot on a lower level of the garage, checked in, and was able to move all our stuff into the hotel room in two easy trips. AMAZING VICTORY. Even more of an amazing victory? I only waited six minutes (literally, I timed it. I got in line at 5:46 and was out by 5:52) to get my Dragon*Con badge. 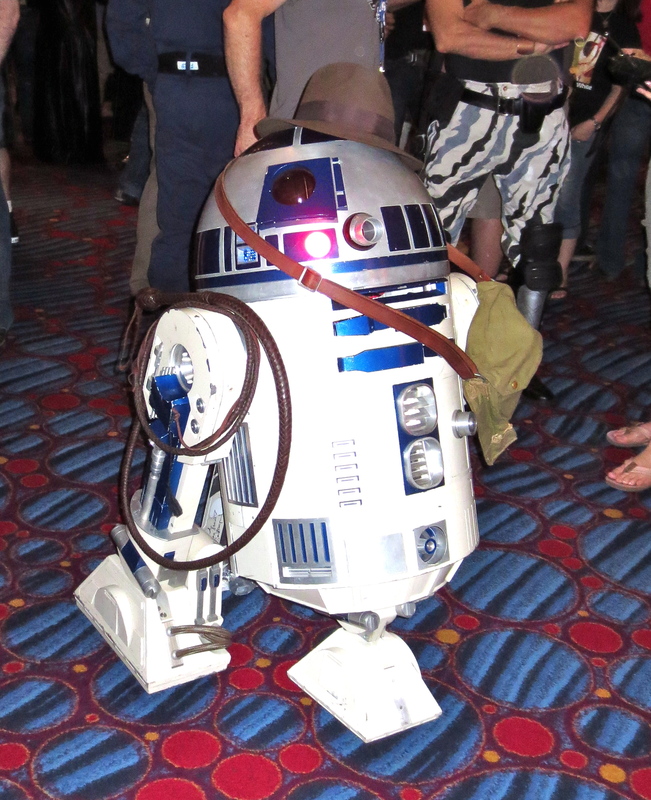 The badge pick-up system the Dragon*Con folks put into action last year is a huge success. It felt extremely weird to not wait at all for my badge, almost as though I had skipped a necessary Con step, but this is a good problem to have! After I grabbed my bag and unpacked (costumes wrinkle, don’t leave them in your suitcase!) I headed to the food court to grab some Yami Yami sushi all by my lonesome. 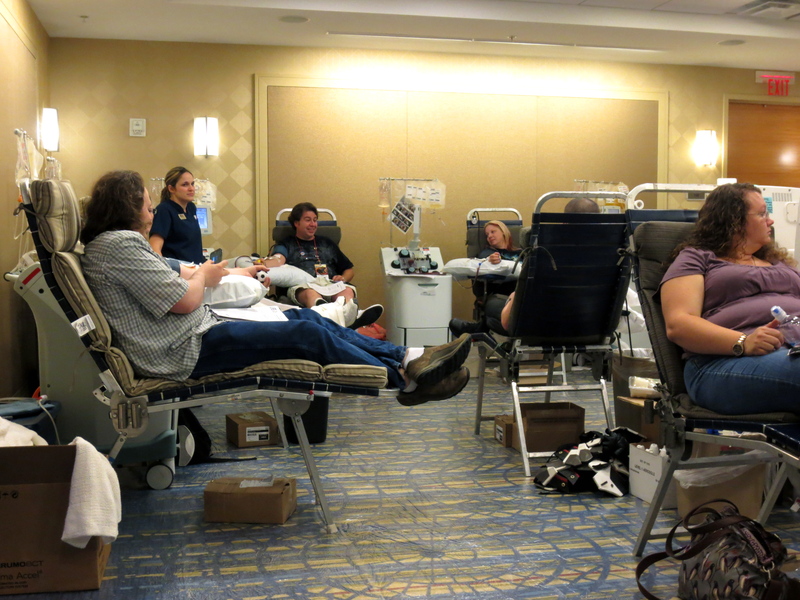 Then, to kill a bit of time, I decided to donate blood at Dragon*Con’s Robert A. Heinlein blood drive. I’ve always wanted to donate in the past, but Con business and Thursday night dinner dates with local friends always cramped my available giving time. Now, however, I had a free-ish Thursday evening, so I decided to do the good deed thing and give some blood. Somehow they got a pint of blood out of me in four minutes?!?! I have no idea how that happened, or how I didn’t pass out after, but it happened. 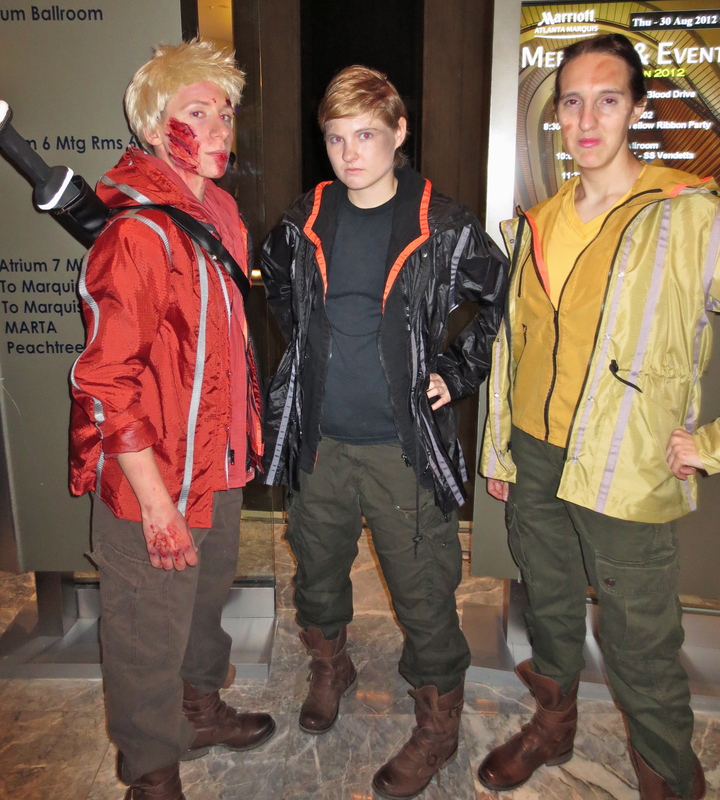 I also made a few fellow blood donor buddies, who I ran into periodically throughout the weekend. Giving blood brings us all together! After giving blood I hustled back to my room to shower and change into costume. Yes, I costumed on Thursday night and yes, that was a first! 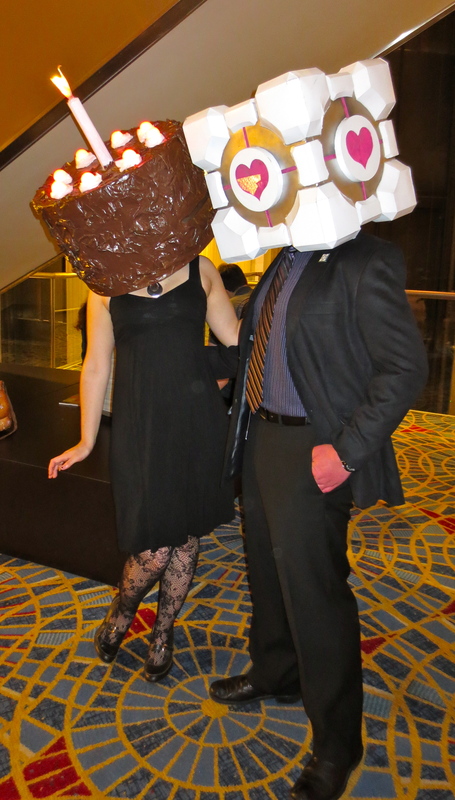 I decided to test run my Companion Cube dress from Portal to see what the response would be. And, guys, the response was fantastic. I don’t think I have ever received as many costume call-outs, high-fives, photo-stops, or general happy and enthusiastic responses. 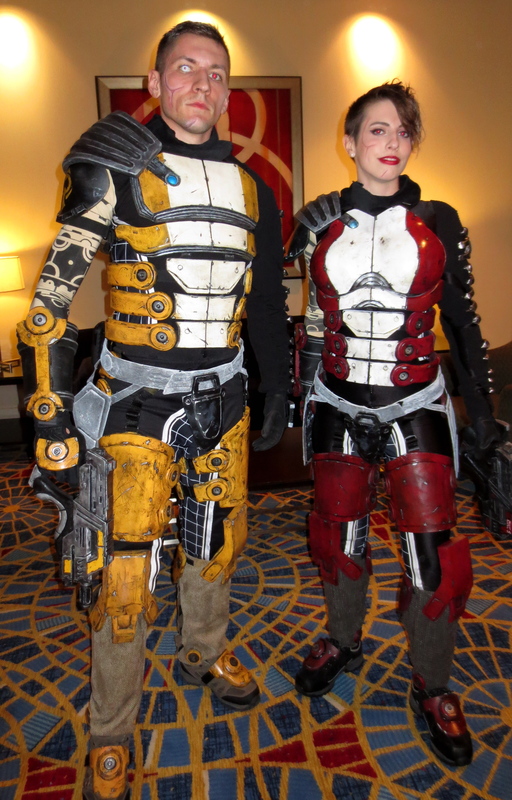 People just loved this costume; everyone knew what it was, everyone was happy to see it. 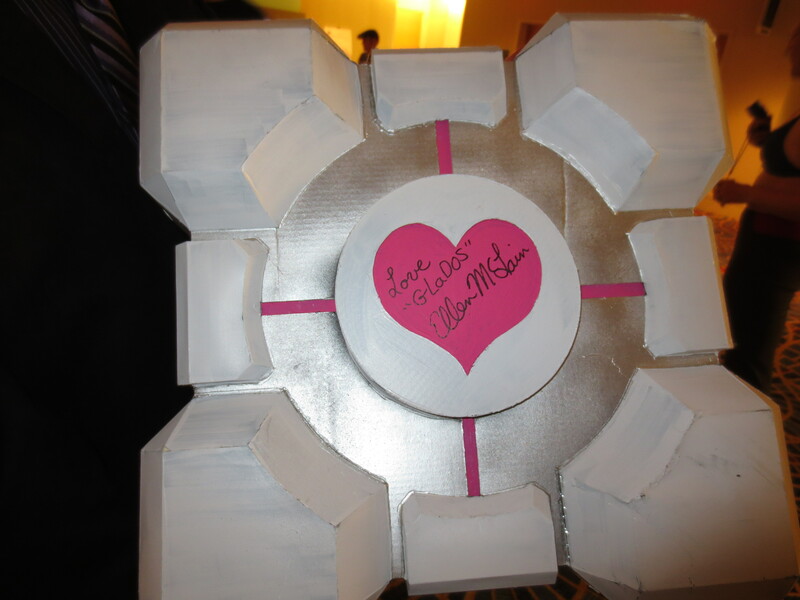 I wore the Companion Cube several times throughout the weekend (it was my go-to comfortable party costume), and people just loved it every time. 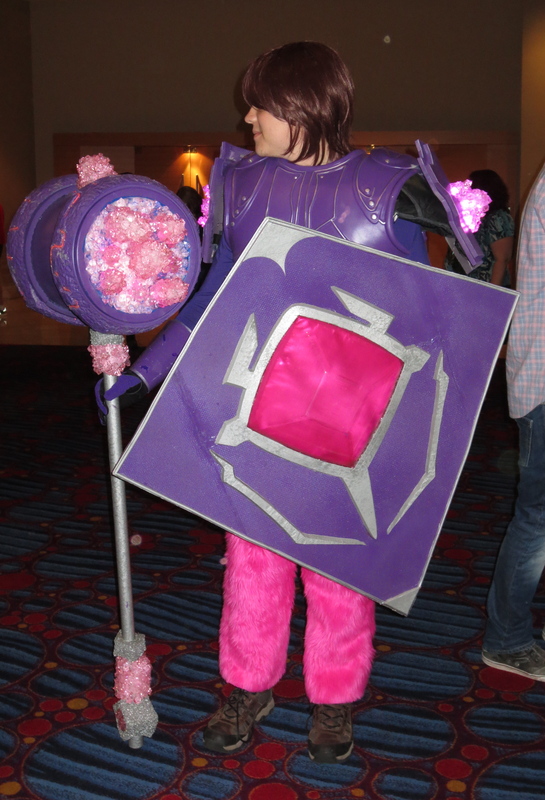 It got the best response out of all the costumes I wore during Con, which is ironic because this is the costume that was held together with double-stick tape and a prayer. Seriously, I just cut out some felt and ribbon and affixed it to a gray dress I already owned with pink tape. I bought the wig from Cosplay.com, the headband (it had little hearts on it) from Target, and the Companion Cube plush that I stuck on the headband was a key chain I purchased from ThinkGeek. The tights and shoes I had in my closet, and the pink heart necklace and pink heart earrings I bought for under $10.00 at Claire’s at the mall. A seriously easy costume, so it amused me that it got such a positive response. I mostly hung out in the Marriott on Sunday night and I took a lot of pictures! 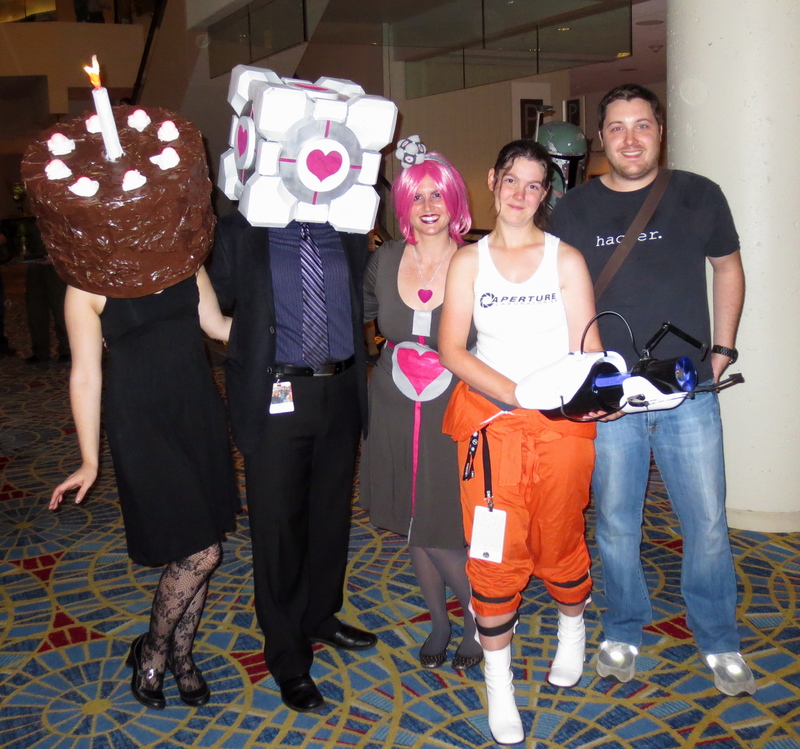 I ran into a number of Portal costumers, including the cake and Companion Cube heads photographed up top, and a Chell with a portal gun that had been made by her husband. The four of us also ran into each other at one point, causing an impromptu Portal photo-shoot. Here I am with one of many Chells I saw throughout the weekend. 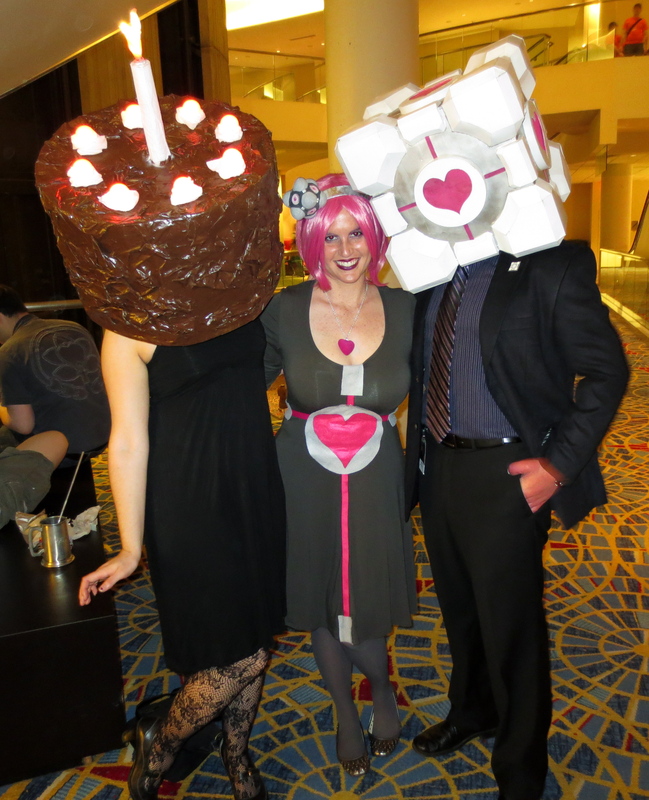 And here I am with The Cake is a Lie and the Companion Cube head. And here we all are together! 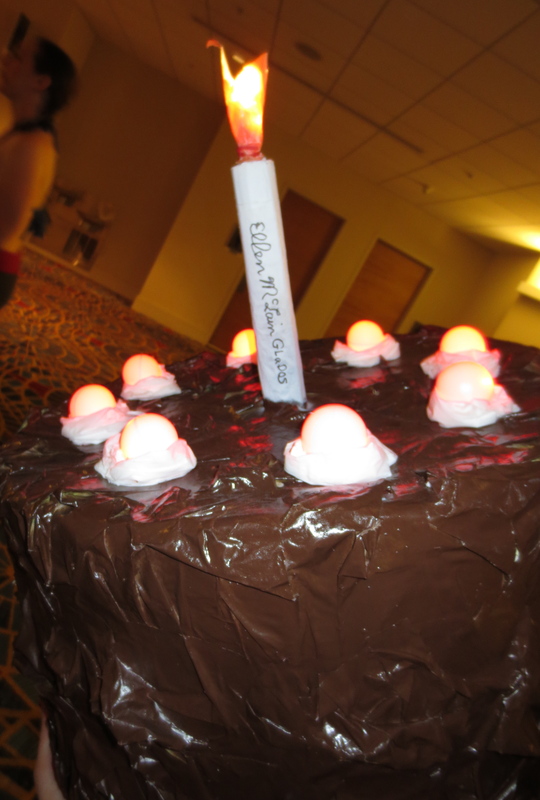 The Cake and Cube heads had had their headpieces signed by Ellen McLain, who voiced GLaDOS, and who was at Dragon*Con–though I didn’t get a chance to see her in a panel. The cake candle and cherry decorations actually glowed, how cool is that?! 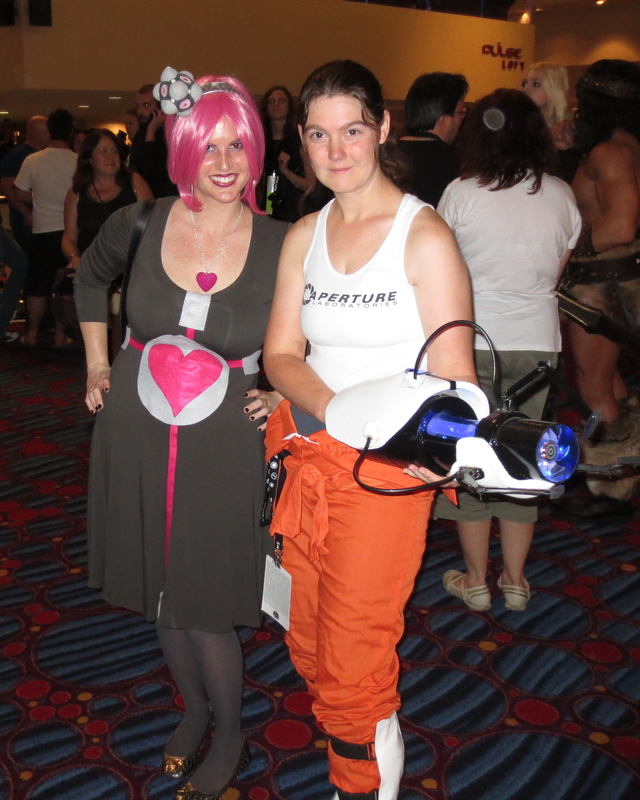 Yay impromptu Portal party! …and here is the front! Yay! It was so great to finally meet her. I also stopped by Valerie’s (the girl who made my Melisandre necklace) bachelorette party to say hello–Valerie was looking very in character in an Amy Pond wedding dress costume. Around 11:30 I started getting REALLY woozy (losing a pint of blood in four minutes will do that to you) so I decided to go back to the Sheraton to get a good night’s sleep for the first official day of Dragon*Con. I know that a few other parties were happening Thursday night, including Con-tourage’s Anything But Clothes party, but I’m glad I turned in early. It allowed me to rest up for the rest of the weekend! My next post will cover Friday’s activities. Hopefully I will get it up soon but, again, CenterFest. Speaking of CenterFest, if you are local (ie: in the Triangle region of North Carolina), you should TOTALLY COME. Also, you should totally volunteer!!! 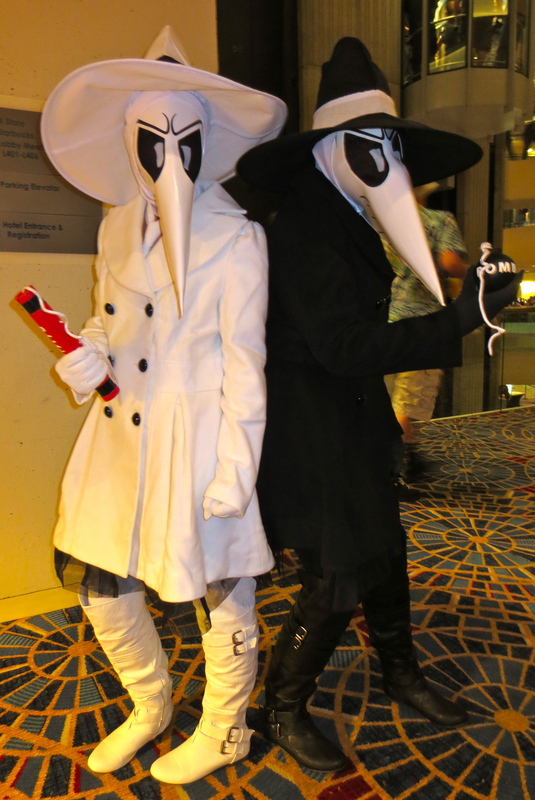 Anyways, more on Dragon*Con soon! And if you are really impatient and can’t wait for more photos, check out my Flickr! 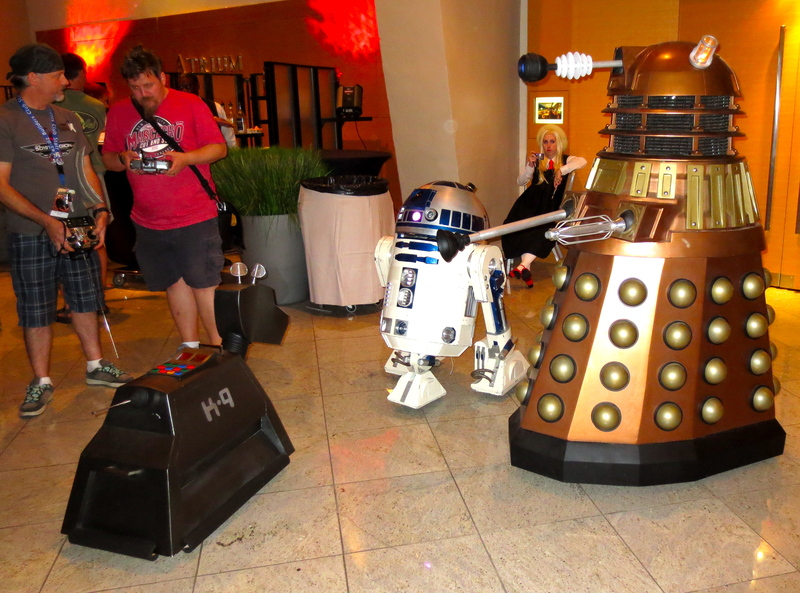 Lots of Dragon*Con photos! Sounds like your Thursday night was fun! I wanted to make it to Valerie’s bachelorette party, but unfortunately I didn’t even get into ATL until about 7:45…and by the time I’d checked in, brought my stuff to my room, picked up my badge and then headed all the way back to my hotel to change, it was nearly 9 PM. And I had on no makeup. I was supposed to be at the ABC party at 9:30 for my VIP pass and literally made it at 9:55…five minutes before they opened the party to everyone else! Crazy.